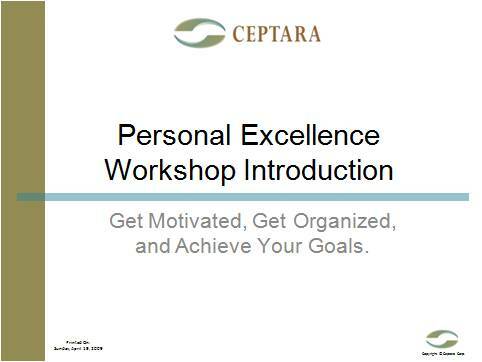 On April 15, 2009, we provided a 60 minute [class] on what it means to be Personally Excellent and how to start achieving it. We had a good turn out and I promised the attendees that I would update my blog with a few pointers we talked about in class. The material presented can be found by completing this [page] and downloading the presentation. It is available in Adobe .pdf format. Additionally, the Outlook Add-in, [Organizer for Outlook], that was used during the demonstration portion of the class can be found by visiting our website and clicking on the 'Download' page. If any of the class participants have any questions, please do not hesitate to contact me. Thank you to everyone who took the time out of their day to attend the class and invest a bit in themselves. Also, please feel free to comment with your thoughts about the class - I'm sure other readers would find them useful.